A group of committed neighborhood activists creates a very promising business model to improve the health of San Francisco’s neighborhoods. A study by the Bay Area Regional Health Inequities Initiative determined that residents of San Francisco’s Bayview-Hunters Point neighborhood have an 8- to 14-year decreased life expectancy compared to their neighbors in other parts of the city. This is due in large part to diet-related illnesses like diabetes, congestive heart failure, hypertension and other types of heart disease. In addition, according to the California Health Interview Survey, nearly 42 percent of adults in San Francisco are overweight or obese. These statistics are perhaps not surprising, considering only one-third of those adults eat three or more servings of fruit and vegetables each day. The problem is exacerbated by the fact that unhealthy food, beverages, alcohol and tobacco products are disproportionately promoted in low-income neighborhoods. Many of these neighborhoods are often located in food “swamps” — areas with a lot of food but not much that is healthy. This makes it increasingly difficult for residents in these neighborhoods to regularly access healthy food and practice healthy habits. Alarmed by the growing nutrition-related health issues in their community and inspired by the 2006 Shape Up San Francisco Summit, a large group of Bayview residents, community-based organizations, city agencies and others formed the Southeast Food Access Working Group (SEFA). SEFA aims to help achieve a “vibrant and robust food system for all Bayview-Hunters Point residents” by improving food access, improving diet through awareness and education, and developing community gardens. SEFA’s first priority was to improve healthy food and retail grocery options in the neighborhood. In 2007, its members conducted and released a survey of resident food preferences that clearly showed that there was strong demand for healthy retail options in the neighborhood. The survey also demonstrated that there was significant retail “leakage” of $38 million as more than half of respondents frequently traveled outside the Bayview-Hunters Point neighborhood to shop at grocery stores. With these results in hand, SEFA launched the Food Guardian Project to increase access to healthy food by improving the retail environment. Building on lessons learned from previous healthy retail efforts in the Bayview, the Food Guardian Project trains residents of the neighborhood to become food justice experts who act as community liaisons with local food retailers. A key goal of the Food Guardians’ healthy retail model is to strengthen — not burden — local, independently owned businesses and help them with education, technical assistance, equipment and funding. 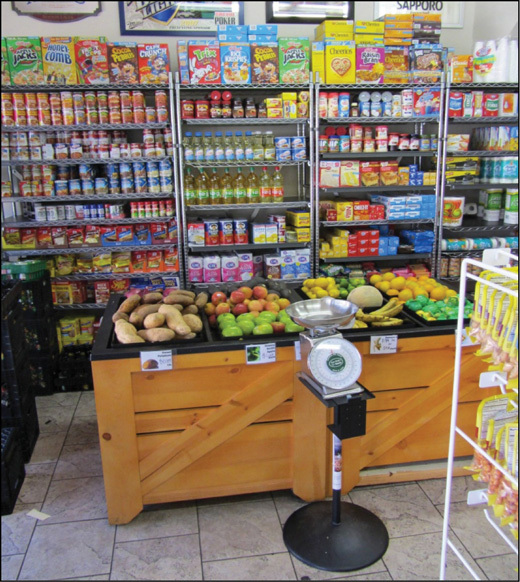 Using data from an exhaustive neighborhood corner store assessment they conducted in 2011, the Food Guardians rated each store using a proprietary scale developed by reviewing healthy retail best practices throughout the country. A rating system scored the results, with three apples being the highest rating. The results were disheartening: Of the 24 stores serving the neighborhood, only two stores earned two apples while the rest earned one or less. In response, the Food Guardians approached each store about converting to a healthier model. They gained traction with the owners of three stores: Lee’s Food Market, Ford’s Grocery and, most recently, Kennedy’s Market and Deli. These store owners were excited about the opportunity to make healthful changes in their stores. The SEFA Food Guardians, together with Sutti Associates, a design firm that specializes in revamping independent grocery stores, began working with Lee’s on the first store conversion. 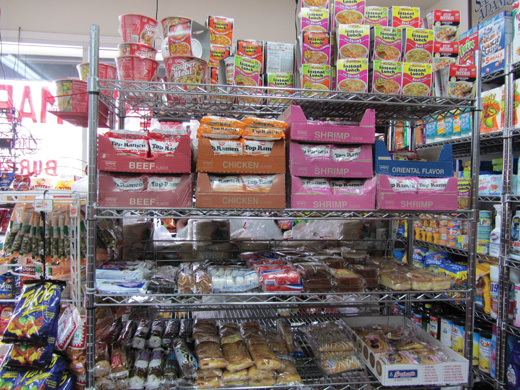 Lee’s Food Market was the first to participate in SEFA’s corner store conversion program. With loans and technical assistance, the store dramatically shifted its layout and product mix, as shown in these before and after photos. According to store owner Naif Jaber, “By offering healthier products, setting up our store in a more appealing way and removing most alcohol and tobacco advertising, we have seen real benefits. Our sales are up, and we no longer have as many problems on the sidewalk in front of our store.” Photos courtesy of San Francisco Department of Public Health. In 2012, Sutti Associates did a significant interior redesign of Lee’s, creating a store that was more cost- and space-efficient and required no major structural changes to provide more space for fresh produce and healthier items. The corner store conversion was an investment by both the store owner and SEFA and affiliated community groups. SEFA secured philanthropic grant money to purchase and finance new equipment like shelving and refrigerators. The San Francisco Wholesale Produce Market ensured that fresh produce was available at a reasonable price. The Food Guardians conducted pre- and post-conversion customer surveys, worked with the store owner on a marketing plan and organized Lee’s grand reopening community event in January 2013. The success of Lee’s encouraged Ford’s Grocery and Kennedy’s to move ahead with their own store conversions, and all three owners are happy with the changes at their stores. Store data at Lee’s shows that approximately 75 pieces of produce are being sold daily, up from no produce sales before the redesign. This is good for Lee’s and for the health of the community. Community activists in the Tenderloin observed what was happening in Bayview-Hunters Point and decided to take similar steps in their neighborhood, another food swamp with more than 70 corner stores but no full-service market. They formed the Tenderloin Healthy Corner Store Coalition (THCSC) and, following SEFA’s model, assessed 53 neighborhood stores. THCSC provided feedback to the owners and is now in the midst of transforming Radman’s Produce Market near the corner of Turk and Jones. The grassroots activism in the Bayview and Tenderloin has led to institutional change within city government. Recognizing that city agencies could help support these neighborhood efforts, Supervisor Eric Mar introduced legislation in 2013 that created the Healthy Retail SF pilot initiative, which is led by the Office of Economic and Workforce Development (OEWD) under Mayor Edwin Lee’s Invest in Neighborhoods Initiative, in conjunction with the Department of Public Health. Through partnerships with neighborhood and health advocacy groups, Healthy Retail SF is building on lessons learned from past efforts to provide incentives and technical support to participating stores. For example, OEWD’s “SF Shines” program will be working with Radman’s and new participants who need to obtain things ranging from rebranding to new awnings. Also, small-business consultants will provide one-on-one technical assistance to ensure a healthy transition in participants’ business models to include healthy food options. The healthy retail model being implemented in San Francisco includes both the business side, to help stores shift their business model, and the community engagement side, to create demand, raise awareness and strengthen community. By institutionalizing support for these healthy food retail initiatives within a city agency, San Francisco has a unique opportunity to change the landscape of many of its underserved communities. Some challenges remain. Long-term funding streams are critical, evaluation systems need to be further developed to capture outcomes and guide next steps, and the creation of economically sustainable distribution systems will greatly enhance the program. But if these challenges can be overcome, the initiatives in San Francisco have the potential to serve as a replicable template for how communities and city government can partner to ensure that many more people have access to healthy, fresh, sustainable and affordable food. Bay Area Regional Health Inequities Initiative, Health Inequities in the Bay Area, 2008.